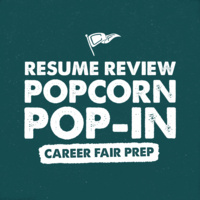 Want to make the most of your upcoming career fair experience? Stop by for some guidance on how your resume can help you stand out from the crowd and make a positive impression on potential employers. Thursday, April 4, 2019, 12 - 4 p.m.
Monday, April 8, 2019, 12 - 4 p.m.
Tuesday, April 9, 2019, 12 - 4 p.m.